Save an extra CDN$ 11.39 (50%). Buy the Kindle Edition instead. Sold by Ladybug+Edmonton and Fulfilled by Amazon. Gift-wrap available. Start reading Tapas on the Ramblas on your Kindle in under a minute. Anthony Bidulka is an avid traveller, party-giver, and sun worshipper. ?One of his?favourite sayings is: "Life may be short, but it can be wide." He lives in Saskatoon and invites you to visit his website at www.anthonybidulka.com. This is the fourth book in his Russell Quant mystery series. 2.0 out of 5 starsWhat Was He Thinking? Bidulka, dispite the chorus of reviews on this page, is at the edge of losing control of his characters and his plot lines. Readers need to be able to suspend disbelief in order to 'go for the ride' and get into the book. Here Bidulka plops characters into the plot without seeming to hear the 'snap' of credibility strained to the breaking point. Without a doubt this book is the worst in the series and, unless some editor reigns him in, Bidulka is going to take a good character and a good series and ruin the franchise with lazy ploting and miraculous appearances of characters - it isn't a 'twist' if it ain't possible. 5.0 out of 5 starsAnother rousing chorus for our folk-hero Russell Quant and his creator Anthony Bidulka! Will add my voice to to the chorus of readers who exclaim, and I agree, that Bidulka is getting better and better with each book. Tapas on the Ramblas is a howl of a read. Dramatic, tense and emotive and all the humour is there from the previous two books in the Russell Quant series. But this time, Bidulka seems to have increased the stakes, both the dramatic plot twists and the emotional lives of his characters are heightened in Tapas to great effect. I keep waiting for the author to give in to some easy resolution with his characters' lives. But he always resists, which builds a real and rare authenticity to his narrative and the players in his unfolding tale. This is a screamingly-good read, with enough plot twists for any mystery fan, but it's Bidulka's insightful humour and colourful turns of phrase that really highlight the uniqueness of his creation. Witty, fun, laugh-out-loud. High adventure murder mystery with our charming and unlikely hero in Russell Quant -- a PI from Saskatoon Saskatchewan travelling the world and rescuing more than one damsel in distress. Without nary a wrinkle in his ubiquitous "wonderpants". Not strictly a gay novel, and that is a good thing in my opinion. Anyone open minded enough to pick it up will be pleasantly surprised at the quality of writing. The author is really good at what he does and I do wonder how much is autobiographical (obviously not the murder part!). A great imagination he really draws you in to the characters he creates. I will definitely be reading more of his work for its quality and subject matter. 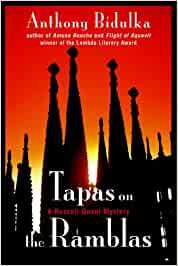 Tapas on the Ramblas is a clever, updated turn on the standard whodunit that is pure entertainment (suspense, humour, pathos) from start to finish. As is this writer's habit, he sprinkles his supposedly simple mystery with superb writing from the first page where he describes a potential client as a brown rabbit in a brown field sniffing the air for danger, to where we are taken on a visit aboard the luxurious yacht, The Kismet and meet its mysterious inhabitants showing off their plumage. In this story, Russell Quant is hired to find out who wants to kill off a matriarch for the inheritance. Pretty typical mystery stuff - but really not so much anymore - it was decidedly refreshing to move away from the blood & guts, government conspiracy, CSI-like stores that have become today's standard mystery fodder, and return to some good, chewy, character-laden stuff with enticing and exotic foreign locales as the background. I changed my mind several times on who I thought the culprit was and I thought I had it but the author pulls out more than one surprise at the end. As usual, the heart of the Quant novels are the characters and even though our roving detective spends little time in his small-city stomping grounds this time around, the author somehow found ways to bring a number of our favourites along with him. Thankfully. And how he makes these subsidiary characters continue to live and develop even (in the case of one of my faves - Russell's mother) in just a few short, well-written lines, is a strength of this writer. Tapas on the Ramblas is a story that is as colourful and bright and interesting as its cover. Highly recommended. Tapas on the Ramblas is a delightful Romp on the Seas. There is something really fun about reading a book like this when its cold and snowy outside and the biggest adventure in your life recently was taking out the garbage. In this Russell Quant mystery, we find our detective aboard The Dorothy, a luxury gay cruise leaving from Barcelona heading directly into trouble! There are bad guys and bad lounge acts, exotic ports of call and (from one of my favourite scenes) a flower pot dropped on someone's head (which is a terrific nod to the Christie potboilers of the past which this feels a lot like). This book is at once fun, frivolous, but not for the faint-hearted - there are some truly scary moments. And, for those following the series from book one, Bidulka, thankfully, does not forget to throw us a few clever tie-ins with the regular cast of characters.